Transition from simulator to "Live"
I am trying to learn to fly R/C airplanes without an instructor. Using RealFlight 8 and their Link-X controller I have accumulated many hours doing the sequence: takeoff / fly the pattern / land. I started with a 3 channel trainer, progressed through most of the 4 channel trainers, both electric and gas, and I'm now flying the gas powered "Big Stick". Maybe 4 out of 5 flights with that end with no worse than a soft crash on the runway or nearby weeds. Some landings are very pretty. Is one's level of proficiency on the simulator likely to carry over to flying a physical model plane? Or should I expect that at first every other flight is likely to result in a busted airplane? My plan is to transition to a FT Explorer 3 channel with "B" series motor and fly in a very large, open area on a day with no wind. My hope is to get 3 to 5 flights between airplane-busting crashes. If I'm likely to be breaking the plane on every or every other flight then I will plan on building multiple planes. Welcome to the forums! I flew realflight 7.5 for hours on end before I got my first plane, and it definitely helped. I could fly, not well, and would crash sometimes with my first real plane, but it definitely helped me. I have found by experience and watching others experiences on these forums that a majority of crashes are caused by the pilot not setting up the plane correctly as in reversed prop, reversed control surfaces etc. Keep in mind that a correctly set up plane will fly itself with little to no input, it’s not totally dependent on you to fly it. Many beginners get so wound up trying to control the plane that they try too hard. Just my thoughts! Good luck and have fun! - Make sure your expo settings on your real transmitter match or exceed those on your simulator. The default expo setting on most transmitters is none. Going from a lot of expo on a simulated trainer to none will make your real plane much more twitchy. In general, more expo is better for beginners anyways, it calms excessive stick motions. - Same with your rates. You don't need the full throw of your control surfaces at first. You can go as low as 50% and still have plenty of control, and this will save you from making excessive inputs. - Make sure you have markings under your wings that let you see the attitude of your airplane easily. Contrasting stripes are common. In real life your airplane can get small fast. Getting confused about the attitude of your plane results in a lot of beginner crashes. When in doubt, waggle your wings and then pull up momentarily - this will give you all the information you need, if you think about it. - Have you been simulating intentional stalls? Learning good stall recovery techniques will save more planes than anything else you can do in simulation. Detecting stalls can be tricky on RC models, and the Explorer drops like a rock if you stall it. - The Explorer has a real tendency to head for the ground on hand launch due to its thrustline, and you need to be quick on the sticks to pull up. Not a good first experience. I would recommend taking it off from the ground. The Explorer can also have some issues with trim if you don't build it perfectly square, and that long wing will never be perfectly square. Also there can be elevator bob due to flex in those long control rods. Trimming a plane on maiden that has a serious tendency to pull one way or another is something sim cannot teach you. It's honestly not the best choice for your first trainer. Nothing can prepare you for the adrenaline of flying something you built for the first time. So if you feel a little shaky, don't force yourself to fly right away as shaky thumbs overcorrect and crash. Take a deep breath, relax for a few minutes and try to be confident. Don't even try to make intentional maneuvers at first, just let it fly and don't let it get too far away. If you turn the wrong way, don't try to correct, just keep banking around smoothly. Your first goal is always to keep it in the air. Good luck! I would build a Tiny Trainer first, they are cheap, modular and can do 2,3 and 4 channel in the same airframe as well as having lots of mod potential. Make the Explorer your second plane. Welcome aboard. I use the real flight 8 and it helped me a lot to calm down and slow down and not over react. I suggest you check out the Tips for Newbies thread. I have only flown the Tiny Trainer, started with 3 channel and on my next flight I will be going to 4 channel. You might break less props with the explorer and I have a speed build kit of it for my next plane to fly. I agree with @FDS, the Tiny Trainer will be easier and cheaper to keep flying. I have made the mistakes and learned to have spare parts to be able to continue to fly more on each trip to the field. 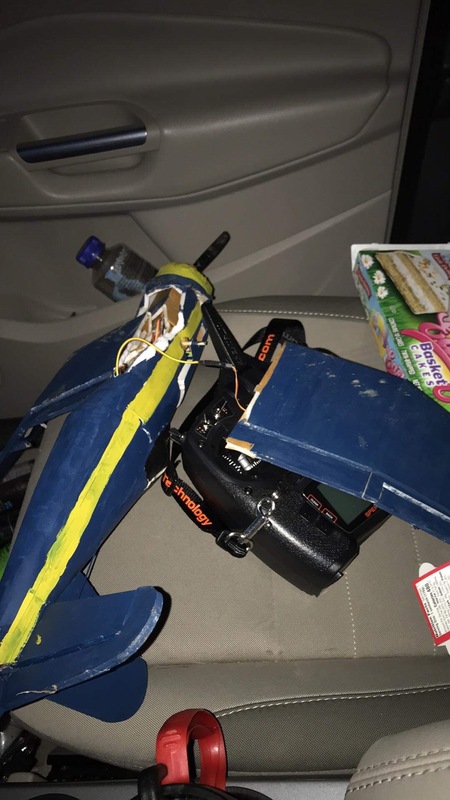 A hard crash can end you day fast, have tape and other items to repair and keep flying. Make sure to video your flights and show them here so you can get some great input to help you along. Packing tape on the bottom of the explorer will give it the slide you need for a ground takeoff. Advantage of an explorer is the size, it is more stable then most ft designs. Make absolutely sure you balance it just a tad nose heavy!! In a lot of ways the sim is harder then real life. It is easy to mess up perspective in the sim. The sim does help build muscle memory. I use it for new maneuvers to build the muscle memory needed, doing 1 maneuver 1000 times on the sim. Good luck! I agree with @FDS and @Jimun and recommend you go with the Tiny Trainer as a starting plane. It's one that is really easy to repair and has a lot of modifications that you can do to it later to give it different flying expriences while trying different so to speak models with an easy to repair airframe. I would also recommend you read this thread might help you out a bit. I've considered the comments regarding the FT Tiny Trainer compared to the FT Explorer. Both are inexpensive, repairable, and work for 3 and 4 channels. The conventional design of the FT TT means that the prop, motor, and landing gear are likely to take the brunt of crash impact. The FT Explorer is about 50% bigger, so it should be 50% easier to see. "Back in the day" I flew free-flight balsa models; my impression was that larger planes had a more satisfying glide, other factors being equal. I ordered the FT Explorer and also the FT Old Fogey quick build kits. I'll see how soon my schedule lets me get to them. The one message that you missed is that you can expect to crash even with tons of sim time. The earth in the real world is HARD and totally unforgiving! Though you should not really worry about it because it is part of the learning and a ever present part of the hobby/sport. Whilst the SIMs are getting good there is still nothing exactly the same as the real thing! The TT will make smaller holes and generally suffer less damage . The bigger the plane the bigger the hole in the ground . If possible look around for the Bixler nose for the TT if you are definitely requiring a pusher design. I haven’t broken a single prop on my TT and the undercarriage I designed has worked great. I have broken 20 or so powerpods since last November, but they are entirely disposable and on the TT fixing them is easy. All the other parts of my TT are the originals, including the wing. If you decide to go with the explorer just read the comments about the model to know what to look for. As far as I understood it has some issues with it. Yes, lots of little thi gs that make a difference with the explorer. Most notable is any sort of wing spar. I used 2 bbq skewers on mine and it has held this far with lots of very hard abusive flight. The other thing is balance. My solution is a 3s 3300mAh battery, gets enough wieght in the nose to balance properly. Other solutions is extending the nose to move the 2200mAh battery far enough forward, or adding nose wieght. One of these days I am going to take everything I have learned with the explorer and build a version that includes all the little mods, including tricycle gear. Then I will take that and bind it with 2 radios in a buddy box system. I think it makes a great design for the first flights of my students, before they go and bang up their own planes. @Hai-Lee ’s awesome fibre tape wing mod has totally stopped the flex in my tired TT sport wing. I started off buying a "trainer plane" and quickly became discouraged with flying it because I would always crash. Through flitetest i learned that I was making huge errors as a beginner so I purchased Real Flight 8, I quickly learned my biggest issue when I started flying was the stick had two positions. 100% and 0%, over the course of hours in the simulator. I have spent many hours in the simulator with planes similar to the ones I have and I took my first actual flight this last week. I did not crash once and I feel that it is because the simulator has given me muscle memory that can only be learned through hands on experience. Try to stay away from SAFE mode unless its a real emergency because I started to feel that when I had it on I was going back to 100% and 0% stick because of the lack of response. Gentle stick movements with adjustment is key to keeping your bird in the air and flying. The characteristics of my real plane versus the one in the simulator (mind you they were exact same model) were different in two main ways. First, the transmitter did need some tweaking and I had to emergency land the first few times because the switches were set up backwards. Second, the simulator tends to focus heavily on steady winds and not gusts. My first flight was a 0-5 MPH wind speed that fluctuated rapidly and affected the plane in ways that the simulator had never done. Overall my plane came back in one piece and I feel this is because of the practice ahead on the simulator. Remember when you land to keep it low speed and flare right before you touch the ground by pulling back on the stick slightly. I would say without a doubt that the simulator is at least 85% of flying in real life with my first flight under my belt with a real plane. These are great tips for the beginner as I have finished my first "real" flight. I find also that I tend to get in a rush because I can't wait to get in the air and often overlook some step like verifying my switch positions. Before I started using the SIM I would rush to get the plane in the air and try to do "neat" things with the plane. Ended up ripping out my motor on my very first flight and was so discouraged I wanted to throw it in the trash. I just finished building the corsair mini and painted yellow lines on the top as your post has stated to tell the orientation of my plane, I chose to do this due to the fact I flew the simulator and quickly realized that this was a big issue when flying a plane. It'll be a while before I get her airborne though, I put together a storch also as my trainer plane before I can do the corsair with F power pack! @only1bobert happy to hear about your first successful flight, looking forward to dome videos in the furture . I'm going the same route. I've been practicing with RealFlight and Phoenix... and hoping the time transfers to actual flight. I'm using a DX9 with Phoenix... which will will the same TX I'll use in real life. Not sure that will make too much difference as the Link-X controller is really good and feels the same. I'm going to try to come in slow for landings... and I'm going to try and remember to cut power to save the prop. Also... little movements. I just ordered the FT Simple Cub and FT Mustang from Great Hobbies here in Canada. I'll be building over the next few weeks. Cheers and good luck. The Flight Test B power packs are on backorder so my order has not shipped. In the mean time I've gotten much better on RealFlight 8. Flying the pattern and landing are fairly routine for me now for many (most?) of the planes. Of the planes that give me trouble, most are difficult for me to see their attitude; a few are just way too fast. I've started working on loops, rolls, and flying inverted.